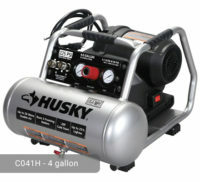 Husky air compressors just keep getting better and better. More unique and innovative features are integrated in the air compressors making them more powerful and efficient. Husky 60 Gal. Electric High Flow Air Compressor has a Thermal Overload Protection System (TOPS) motor which protects it from high voltage fluctuations. It ensures that the motor would not overheat and can accommodate the voltage that it takes from the power source. The motor has a heavy-duty induction style that can perform both garage and industrial activities. 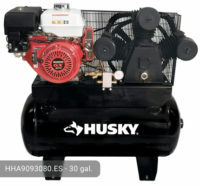 This Husky 60 gallon air compressor provides high flow delivery of air giving 18 CFM at 90 psi. The maximum pressure is at 155 psi. The model is a single-stage compressor which can be used to power both simple and complex pneumatic tools. In addition to the TOPS motor which prevents overheating, the compressor pump cooling is also improved because of the metal belt guard that has been designed uniquely for the intended purpose. The motor has a power output of 3.7 HP. This is stronger than other models with the same tank capacity. With this power, it can easily perform both light and heavy-duty tasks such as, but are not limited to, the following: brad nailing/stapling, hobby nailing, inflation of automotive tires, grinding, air blowing, spraying, and surface preparations. If you are thinking that the tank will be heavy because of its 60-gallon capacity, you are wrong. The ASME air receivers make the total weight of the compressor to be uniformly distributed so that it becomes lighter than the traditional compressor models. This Husky HLA5746080 model has a 1-piece cast iron crankcase for additional protection. The tank has a cylinder body which is also made of cast-iron so expect a long-lasting material. 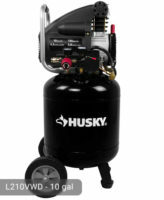 A 16-inch cast iron balanced flywheel is also present to provide support to the high-level revving engine of this Husky 60 Gal air compressor. 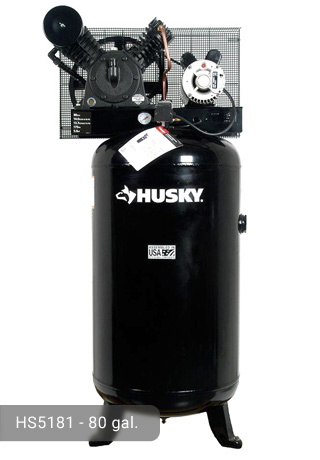 To provide an extended life, this Husky 60 gallon air compressor is oil-lubricated. Because the user will need to maintain the machine and do oil changes, there is an oil level sight glass for the owner’s convenience. The oil fill can also be accessed and replaced easily. The package already comes with a synthetic oil to avoid the hassle of searching for the right type of oil. The synthetic type is now being commonly used because it provides optimum performance. To ensure that the air is free from contaminants such as dirt and moisture, this model has a large intake filter/silencers. Unlike other models which have standard-size filters only, this one has a much larger coverage. 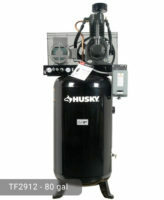 The durable Swedish flex-leaf valves made of stainless steel is another unique feature of this Husky 60 gallon air compressor. It is not meant to be portable because it has no wheels and handle. However, it has a 4-feet stand so you can mount it on a stationary position. The tank has a vertical orientation so it would not take too much space. However, it is not as slim as the other models. It produces audible sounds during its operation (up to 84 decibels). This is expected though because of its huge size. The motor is electric-powered so you would need to plug the machine in a 230-volt power outlet to start running it. Husky 60 Gal. 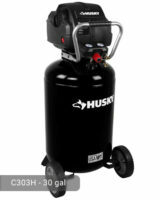 Electric High Flow Air Compressor only costs $1,299.00. With all the awesome specifications that this model features, every single dollar is worth it. 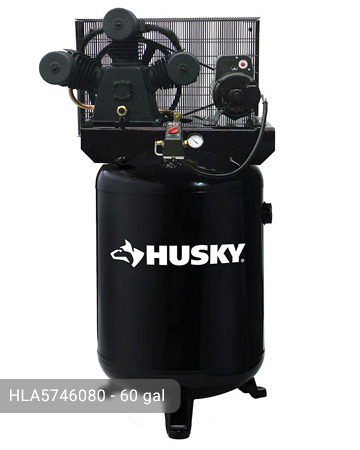 If you need a unit that is proven and tested to produce high-quality output, try Husky 60 Gal Air Compressor HLA5746080 model. You wouldn’t ask for more because it has all the features that you would want. If you already own Husky HLA5746080 model or just want to buy it, feel free to share your review or ask a question through the form below. What is the duty cycle of your air compressors? I’m looking at a HLA5746080 or conversely, a C803H at home depot. Also, where can I purchase the hla5746080?